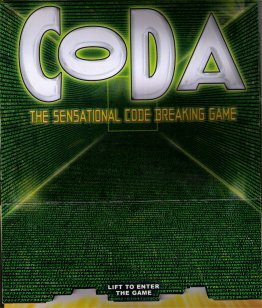 If you enjoyed reading The Da Vinci Code, you'll love playing Coda! A runaway hit in Japan, CODA is the international code-breaking sensation! Try to crack your opponent's code before yours is revealed. Guess one of the opponents numbers to expose it and then add to your secret code. Guess incorrectly and you must reveal one of your own numbers. On each turn, a new number enters play. Use your intuition and detective skills to be the last player standing! Contents: 26 plastic panels (set of 13 black and set of 13 white) and illustrated rules. Coda is a light deduction game recently published by Winning Moves. Deduction games are one of my favorite types, so I was excited to give this one a try. The components are simply 12 black and 12 white plastic "tiles" with numbers printed on them (0-12). There are two special tiles with dashes on them which would be used in an advanced version of the game. Players start with a "code" of four numbers (or three numbers if there are four playing). They arrange their tiles in numeric order from left to right, but since the tiles stand up, opponents only see the backs. On a turn, a player draws a facedown tile from the center of the table and looks at it. He then "attacks" another player's code by pointing at one of the player's tiles and declaring the number he thinks is on that tile. If he's correct, the tile is tipped over so all players can see it. The active player can then continue making attacks as long as he is correct, or he can stop and insert his newly drawn tile in the correct position of his code (with the back facing everyone else). If he's wrong on any attack, he must reveal the tile he drew at the start of his turn and then insert it in his code. Hopefully it's clear that the game progresses from much hidden information to an interesting point where just enough information is available that deduction can take place. Memory plays a large role in the game because you aren't allowed to write down what you or other players have guessed while making attacks. It should be clear that such a guess made by a player is very revealing as to what that player doesn't have in his own code (unless he's playing very poorly!). We've had fun with Coda in all the groups I've tried it with. Two of my students in Pre-Calculus took to the game and played it repeatedly for a whole class period during our recent "game day" before spring break. The game is short enough to have that "let's try again" quality. Since it works for up to four players, it makes a nice alternative for kids who like Mastermind but would prefer to compete with more players. This is a great game, something people will still be playing 100 years from now. This is a deduction game in the Master Mind mold. only a few components and it plays fast with rules that can be taught in 30 seconds. It plays well from 2-4 players and it's cheap too. Try it!